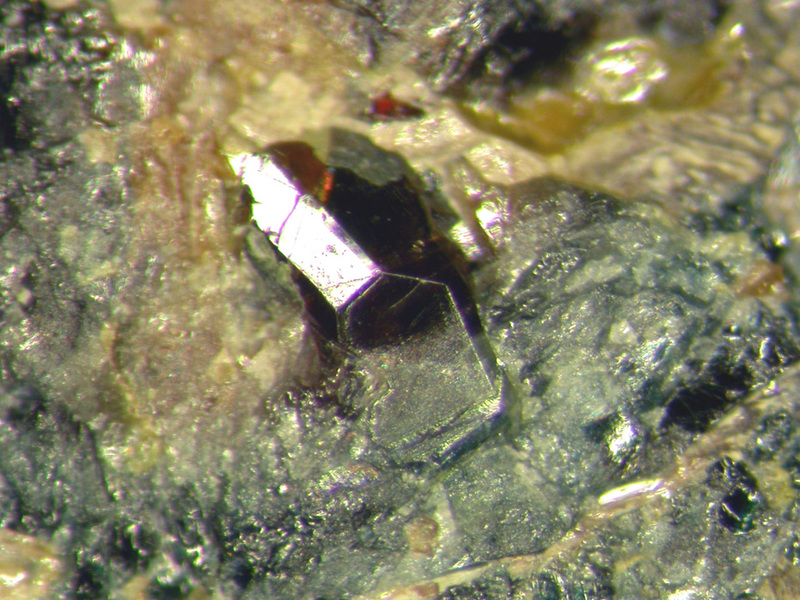 Natrobistantite: Mineral information, data and localities. Natrobistantite studied by Voloshin et al. (1983) and by Beurlen et al. (2005) are both a zero valent dominant member of the microlite group with significant contents (in wt.%) of bismuth and cesium. According to modern microprobe data at least part of Natrobistantite specimens are Hydrohynatromicrolite. Approved as a new mineral by IMA in 1982. Clinobisvanite 2 photos of Natrobistantite associated with Clinobisvanite on mindat.org. Bismutite 1 photo of Natrobistantite associated with Bismutite on mindat.org. Voloshin, A.V., Pakhomovskii, Y.A., Stepanov, V.I., and Tyusheva, E.N. (1983) Natrobistantite (Na,Cs)Bi(Ta,Nb,Sb)4O12 - New mineral from granite pegmatites. Mineralogicheskii Zhurnal 5(2), 82-86 (in Russian with English abstract). American Mineralogist (1984) 69: 407-408 (abstract). Beurlen, H., Soares, D.R., Thomas, R., Pradodo-Borges, L.E., and Castro, C. (2005) Mineral chemistry of tantalate species new in the Borborema Pegmatitic Province, northeast Brazil. Anais da Academia Brasileira de Ciências: 77: 169-182. Atencio, D., Andrade, M.B., Christy, A.G., Gieré, R., and Kartashov P.M. (2010) The pyrochlore supergroup of minerals: nomenclature. Canadian Mineralogist, 48, 569-594. Beurlen, H., Soares, D.R., Thomas, R., Pradodo-Borges, L.E. & Castro, C. (2005): Mineral chemistry of tantalate species new in the Borborema Pegmatitic Province, northeast Brazil. Anais da Academia Brasileira de Ciências: 77: 169-182; Atencio D., Andrade M.B., Christy A.G., Giere R., Kartashov P.M. (2010): The pyrochlore supergroup of minerals: nomenclature. Canadian Mineralogist, 48, 569-594. A. V. Voloshin, Y. A. Pakhomovskii, V. I. Stepanov, and E. N. Tyusheva (1983): Natrobistantite (Na,Cs)Bi(Ta,Nb,Sb)4O12 - New mineral from granite pegmatites. Mineralogicheskii Zhurnal: 5(2): 82-86.